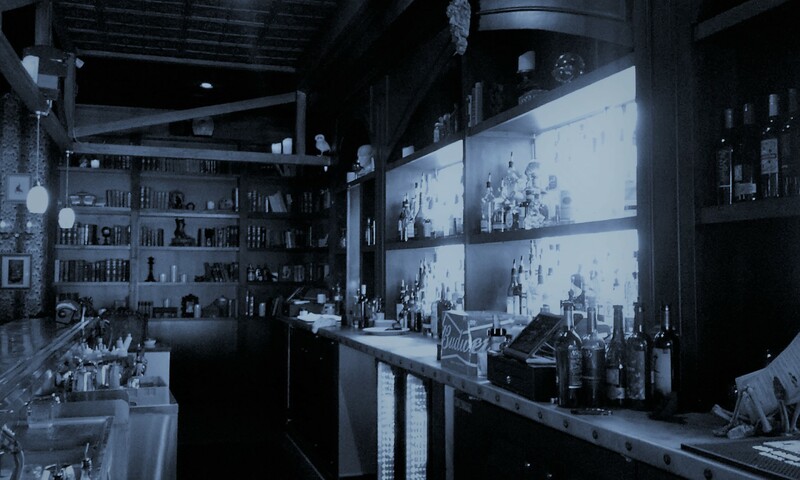 Looking for a place to refresh your weary spirits after a long evening of Halloween haunting? Visit The Cauldron. 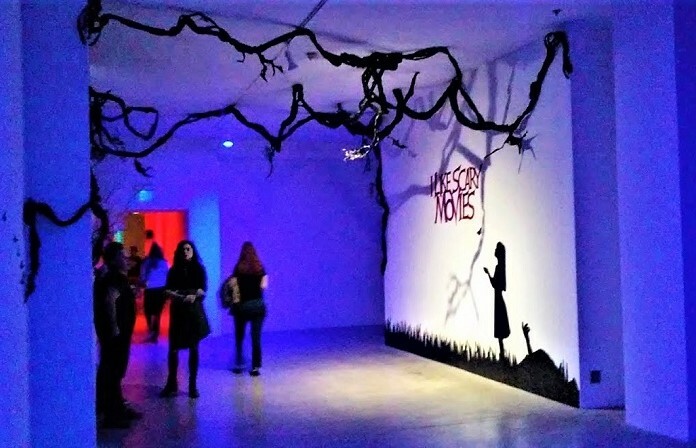 You have plumbed The Depths and taken a Dark Ride through Shadowlands at the Knotts Berry Farm Halloween Haunt. Exhausted, you seek sustenance after leaving the theme park. But where do you go? Fly your broom over to The Cauldron. What is the Cauldron? Located on Beach Boulevard in Buena Park, across the street from Knotts Scary Farm, The Cauldron is horror-themed bar serving "spirits and brews," with such appealing names as the Grey Witch, Chupacabra, Hell Hound, and The Raven's Claw. 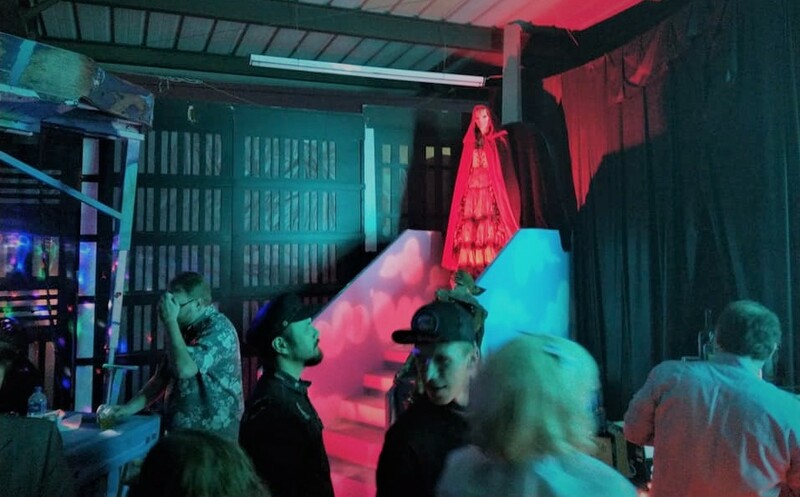 Although it is open year-round, The Cauldron resembles a Halloween pop-up bar, making it the perfect destination for horror fans seeking refreshment after an arduous evening of mazes and monsters. It is also recommended to weary travelers who failed imbibe to their limit while sailing the high seas at the Vampirates Dinner Adventure a few blocks north. If we had to describe The Cauldron in the proverbial nutshell, we would liken it to the reception area of a Halloween haunt, like the lobby of Mabel's 6 Fee Under. 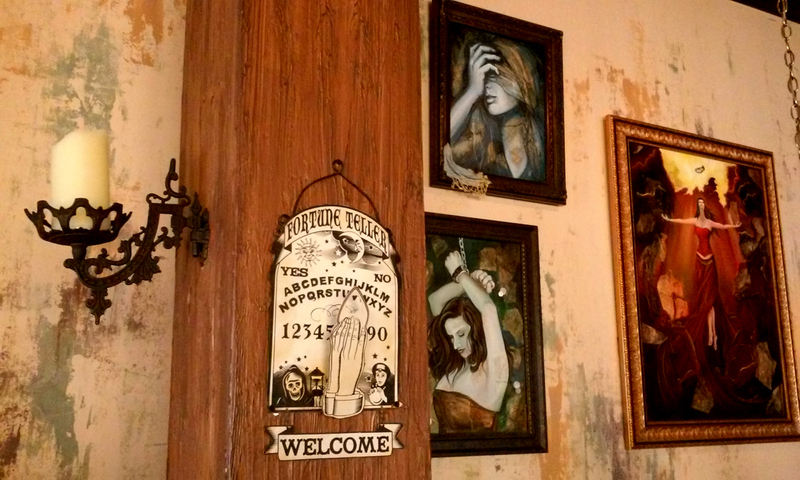 Macabre paintings and ouija boards adorn the walls. Skulls and candles decorate the bar and tables. A stone fireplaces houses - you guessed it - a glowing witch's cauldron. 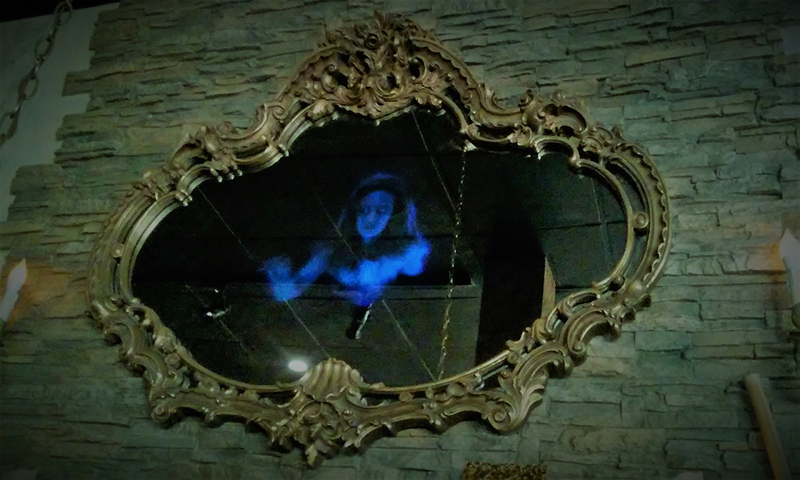 Above, a magic mirror reveals otherworldly glimpses of phantoms and disembodied eyeballs. There's even a sliding door that reveals a hidden room - though, unfortunately, it does not lead to a haunted maze. The bookcase behind the bar hides a secret room. The Cauldron's menu is three-quarters beverages and one-quarter food. There are no dinner combinations, but one could assemble a decent meal from a combination of tasty morsels and appetizers. So far, we have sampled the Gougeres (savory cheese puffs) and the Beet & Chevre Salad, both of which were excellent. The lovely libations include beer, wine, mixed drinks, non-alcoholic options. Wines (with names like Dragonette Seven Syrah) range from $6 to $12 a glass. Along with conventional beers, there are ciders and ales, not to mention Voodoo Stout and something called Dragon's Milk. Unfortunately, the one beer we sampled was not very memorable; however, the mixed drinks are another matter entirely. The Blood Lust Martini is a real thirst-quencher - assuming your thirst tends toward Vampyre and Blavod vodka. Even better is the Black Cauldron, a martini with Kahlua, Vodka, and cold-press coffee. We are also pleased to note that, after discussing James Bond's famous Vesper Lynd martini with the bartender during our first visit, the bar now prominently displays a bottle of Lillet Blanc, one of the necessary ingredients. So even though it is not on the menu, you can order 007's famous drink, "shaken, not stirred." Despite the spooky decor, The Cauldron is not intimidating, even for children. The ambiance is low-key and friendly, day or night. There is no booming house music to draw a trendoid crowd on weekends. There seems to be a regular crowd of locals, but of course the Halloween season brings haunt-seekers visiting the local seasonal attractions. The closest comparison we can make to The Cauldron is the Phantom Carriage Brewery and Blendery in Carson, another horror-themed location offering specialty drinks for horror fans. Phantom Carriage has the advantage of crafting its own unique ale and beer, but the Cauldron features a greater variety of beverages and more elaborate decor. Both are worth visiting all year round, but The Cauldron's proximity to Knotts Scary Farm and Vampirates Dinner Adventure makes it a must-see destination during the Halloween season. It looks like a Halloween popup bar, but it does not pop up in October – instead, The Cauldron’s spooky decor and horror-themed menu will keep your Halloween spirits high all year long. Update: Since this review originally posted, we have added ratings for the New Moon Martini and the Vesper Martini. The former is a season specialty made with black vodka and yellow chartreuse, with moon dust to provide a glitter effect. It tastes like absinthe – sweet – which is not what one expects from a martini, but not bad. The Vesper Martini is a variation on the Vesper Lynd, the martini that James Bond drinks in the novel Casino Royale. Made with Nolet’s Gin (instead of Gordon’s), vodka, Lillet Blanc, and garnished with an onion instead of lemon peel, the Vesper Martini is as good as the original. The Cauldron is located at 8028 Beach Boulevard in Buena Park. It is open Wednesday through Sunday. For more information, visit: thecauldronbar.com.